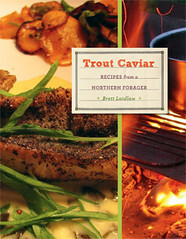 10,000 Books Weblog : Minnesota Historical Society Press » Trout Caviar Solves Tomato Glut! Trout Caviar Solves Tomato Glut! It froze last night, and the tomatoes are coming into the house fast, fresh, and flavorsome. Lucky for us, Brett Laidlaw’s Trout Caviar: Recipes from a Northern Forager is just out, and he has a solution: Oven Tomatoes with Herbs. The book is packed with enticing tales, practical tips, and recipes that deliciously showcase distinctive northern flavors and products. Laidlaw, who inspires local cooks and eaters with his Trout Caviar blog, tells the inside story of the book in today’s post. The best scene, from the publisher’s view: a grumpy guy saved from a crabby night by the thought of writing a book.